To play or not to play? That seems to be the perennial question in early education—and one that has been a hot button issue in recent news. As mounting evidence suggests that children do better in school in the long run when their pre-K curriculum is play-based rather than didactic, discovery play in the classroom has never been more important. In fact, at a featured session at NAEYC this year, hands-on learning through the use of makerspaces was discussed as a way to promote creativity and active learning in the classroom. So what exactly is a makerspace and how can it promote play-based learning? Play-based learning embraces giving children time to carry out their own ideas through play. Children are allowed to explore information in their surroundings in an experiential, exploratory way, rather than in a didactic, script-based format. Play-based learning incorporates sensory learning and can include activities such as the arts, nature, and music. The teacher’s role in play-based learning is to provide the children with stimulating, imaginative ways to play and assist them in their exploration. The primary difference between the two methods of learning is that play-based learning is student-initiated, whereas didactic learning is teacher-led. A makerspace is a designated space in a classroom that is designed to keep versatile materials at a child’s fingertips for “making.” Your makerspace could be a table, countertop, cart, or a structure you build yourself. Keep it stocked with hands-on materials that promote innovation. Whether the end result is a model house, a drawing, or a robot, having a variety of multisensory tools on-hand will encourage students to create through play. Numerous studies conclude that play is an integral part of learning for preschoolers. An article in The Washington Post suggested that inadequate playtime and movement can cause problems in children such as clumsiness, difficulty paying attention, trouble with emotional responses, and poor problem-solving methods among a host of other developmental issues. At Learning Without Tears, our goal is to make learning fun and easy. We offer multisensory, play-based tools and activities for children to learn vital kindergarten readiness, reading, and writing skills. 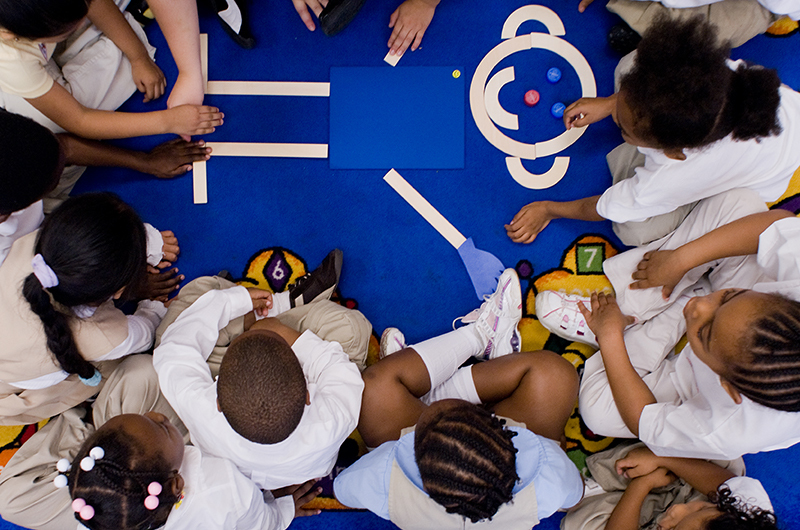 Play-based learning tools like Roll-A-Dough give children tangible ways to create and play. Remember to keep your makerspace well-stocked with materials that make it easy to build and innovate: our Mix & Match Shapes help children use their imagination to make patterns and build designs. By Megan ParkerMegan Parker received her Bachelor of Science degree in English from Towson University. She has a background in writing for children that includes working in the editorial department at Girls’ Life magazine, where she wrote for the print magazine and website. She has versatile experience as a writer, editor, and copywriter, and her writing has been published in magazines and newspapers. When she’s not having fun creating imaginative content at Learning Without Tears, she loves to travel the world.